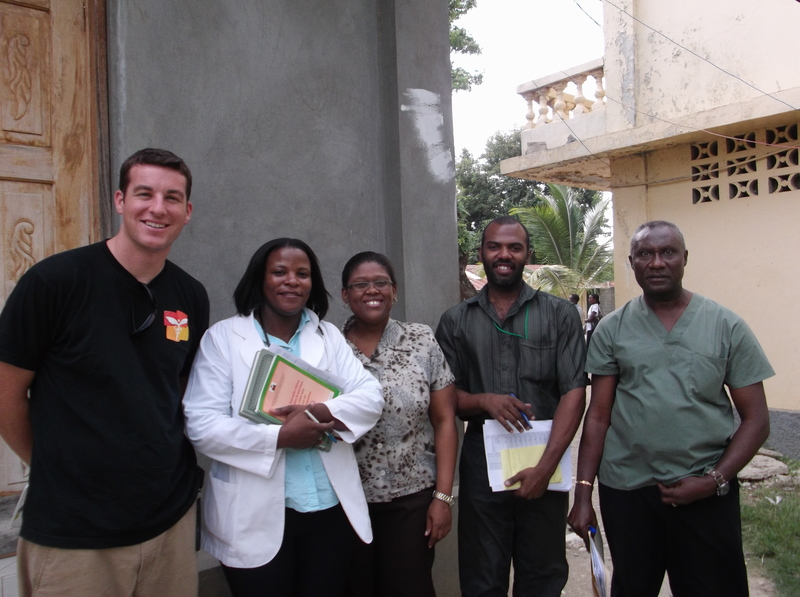 This is a personal From the Field story by Direct Relief’s director of International Programs, Andrew MacCalla. Yesterday afternoon my colleagues and I took the thirty minute flight from Port au Prince to Port de Paix in the far Northwest of the country. We came to the north to visit two more hospitals to upgrade the conditions of their maternity wards and encourage more women to come to the hospital for pre-natal visits and delivery. As we drove down the long, bumpy and muddy road from the airport to the hospital I was struck by the fact that this town seemed to be the poorest I’d seen in Haiti. There were almost no other cars on the road (as compared to the constant traffic in Port au Prince) and the houses and roads looked to be in even worse shape than those in the capital. However, when we arrived at Beraca Hospital were greeted with a hot lunch of chicken, fish, plantains, rice and beans and a team of doctors and nurses who were eager to hear what we had come to offer. Once again, I was struck by the eagerness and commitment of this medical staff to their jobs despite the fact that many of them had not been paid in months, their pharmacy had almost run out of stocks, and their sterilizer had broken so they had resorted to sterilizing their instruments in a pot of boiling water. This particular hospital had been funded by missionaries since it opened but funding has stopped and they haven’t received any outside support in over 10 years. Since they are not a government hospital, they do not receive any funding from the Ministry and thus have to rely on patient fees to support the hospital. That is almost unheard of in Haiti because it is simply not a model that can work here. Many patients cannot afford to pay for basic care. For example, ever since this hospital raised their fees for deliveries to 1,000GDS (roughly $25 USD), they only do 30 deliveries a month compared to the 100 they did before. So instead, the women have to deliver at home with the assistance of a matron who is often untrained and ill equipped to handle anything outside of a normal, perfectly smooth delivery. This morning we left Port de Paix to head for La Tortue on a small boat with an outboard motor (that broke two times during the journey) and a purple velvet curtain attached to a PVC pipe that they used as a sail and boom. (The resourcefulness of Haitian people never ceases to amaze me). When we reached the island of La Tortue I thought I might be at the end of the earth. This is an island of 40,000 people but only has 10 cars and a couple tiny boats to get supplies across. The steepness and bumpiness of the unpaved roads is astounding. A couple of times I thought for sure the Land Cruiser transporting us was going to tip over backwards due to the incline. And now, it’s 7pm and I’m sitting on the balcony of the only guesthouse in town overlooking the whole island that stretches nearly 50km long and 7km wide and there are no lights on as far as you can see in any direction. Indeed, the hospital we visited today only has power for 6 hours per day using a generator, does not have running water, and has to send patients to the hospital in Port de Paix (in that same velvet sail boat that takes nearly an hour—not to mention the trek to get to the water) if there is an emergency. Today the doctor told us about a woman who came to deliver her baby at the hospital but he could not deliver the placenta no matter what he tried. So he sent her down the incredibly steep and bumpy road in the Land Cruiser and across the ocean in the velvet boat in order to be seen at the public hospital in Port de Paix. However, since this woman did not have the $30 for the procedure, they would not see her. So she waited outside the hospital for 4 days, meanwhile becoming infected, until finally her family was able to gather the money to get the hospital to perform the procedure. This is an island where the hospital used to be the premier facility in the Caribbean and people traveled from neighboring countries all over the Caribbean to come for treatment. Today, I met the doctor at that same hospital on this same island and his first request was for a better boat so he could get patients away from his hospital and across the ocean to a different one. This is the island where Napoleon’s sister once lived. Today, Napoleon’s sister’s house has been reduced to the foundation because the stones from her house have been used to build dozens of other houses around the island by people who don’t have any other resources to use.